I had the wonderful opportunity to witness bird artist David Sibley speak today at Point Pelee National Park. Known for his nature field guides, he is a keen observer and masterful with the paint brush. I always cherished his Sibley Guide to Birds as an essential tool for my tricky bird identifications, and I was very enthusiastic to finally meet him. In his presentation, Sibley demonstrated the development of his skill as an artist from age eight to the present. He explained that sketching from life is an important way to familiarize yourself with birds and to improve your drawing abilities. He admitted that keeping a field notebook requires much time, repetition, and patience; however, it comes with many rewards. I found Sibley’s Northern Hawk-Owl drawings especially memorable, which beautifully conveyed how practice allows you to progress as an artist. David Sibley certainly inspired me to be sketch birds more and to allow my drawing and observation skills to soar. I sincerely hope that one day my sketches and paintings will attain David Sibley’s level of proficiency. 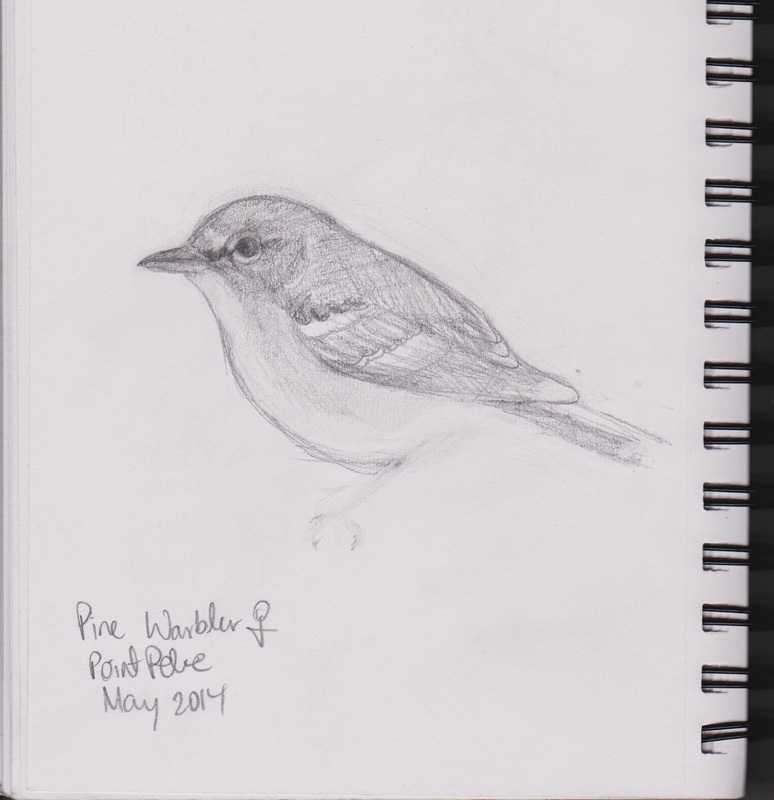 Above is my sketch of a very cooperative Pine Warbler. I observed it on the DeLaurier Trail at Point Pelee National Park. I am a teen birder and I began my life list in early 2011. It all started when I was six years old and a male Red-winged Blackbird flew right at my head at the park. I was terrified, but I wanted to know more about these curious creatures. To this day, I continue to explore and discover the infinite surprises of nature. In the future, I hope to become a naturalist or an ornithologist to always stay connected with my interests.